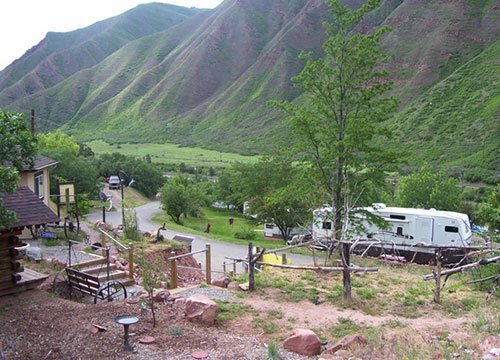 Family owned and operated since 1973, Ami’s Acres campground offers an excellent camping value in a perfect Glenwood Springs location. About three miles west of downtown Glenwood, this unique property is surrounded by mountains on all four sides with views of the Colorado River. Ami’s Acres offers RV spots, tent camping, group spots, and Mountain Man cabins. Large RV camping sites offer parking spaces for up to 2 additional vehicles, full hookups (electric, sewer, and water) and easy pull through access for your convenience, up to 42′ RVs allowed. There are also smaller RV sites with just electricity and water, however, these are located near the bathhouse which may suit you better. Tent camping sites have excellent views, including some very private and secluded spots including a few walk-in sites. Most sites have mature trees and tables and are separate from the RV area of the campground. The quality and cleanliness of Ami’s Acres creates a unique alternative for your family or groups accommodations.